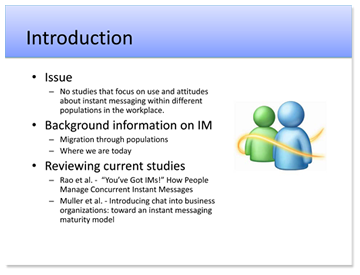 This course project was based on a literature review conducted to investigate prior research on concurrent instant messaging (IM) in the workplace. 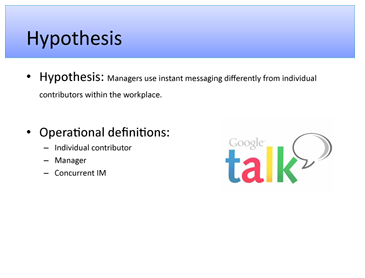 For this project, the primary goal was to examine the differences in instant message (IM) use between managers and independent contributors within the workplace using emperical research methods. 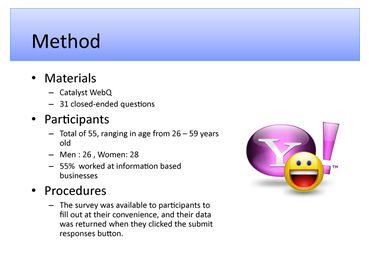 Data collection consisted of a web-based, digital survey in which the url was distributed to other students within the course, on the department blog, and to any contacts know to have used IM within the workplace. 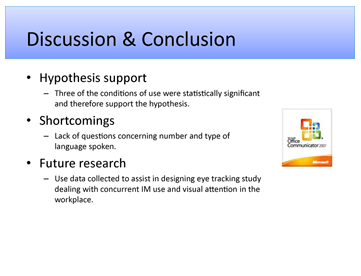 The results were statistically analyzed in SPSS. 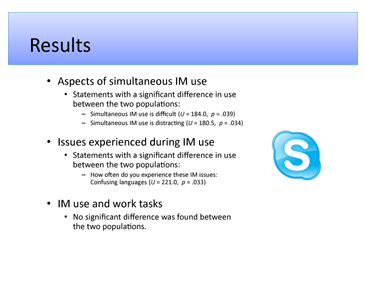 It was found that differences in IM use was most likely due to difference in work tasks and native language. The findings were presented in a research paper and a powerpoint presentation.